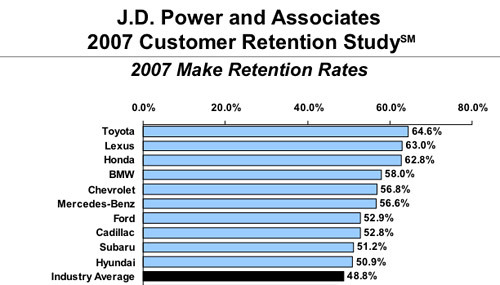 Lexus has ranked second in JD Power’s 2007 Customer Retention Study, retaining 63% of its new car buyers. This was only topped by Toyota, Lexus’ parent company, with 64.6%. This doesn’t surprise me at all, reliability and customer service holds a lot of weight in the minds of most car buyers, and Lexus has excelled at both since its inception. Customer retention may become even more important to automakers in the coming years, as new-vehicle sales between 2007 and 2014 are expected to increase by only 8 percent, or about 1.2 million units. I imagine this small industry increase of 8% is for the United States only, but there isn’t a lot of room for error in such a tight market. Retaining customers is going to be all the more important, and Lexus’ rate of return only speaks well for its continued success.